I have to give you a warning about this weekend’s challenge: it’s addictive! That’s because it’s a stretch that effectively relieves neck pain or cervicalgia due to tight, weak anterior flexor muscles in the front of your neck. 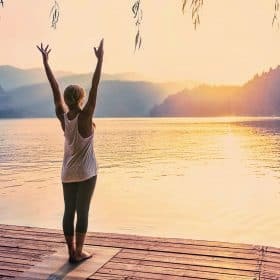 The Cervicalgia And FHP Technique loosens those muscles, which can become shortened and contracted when you repeatedly lean your head down and forward in the all-too-common postural habit known as Forward Head Posture (FHP). The anterior flexor muscles are utilized to properly position your head by aligning the ears over your shoulders. In order to achieve that posture, they need to be supple and strong, so let’s get started! For much of human history, mankind’s daily routine involved lots of movement and physical work. In fact, people had to find the time to get a bit of rest. Nowadays it’s the opposite. 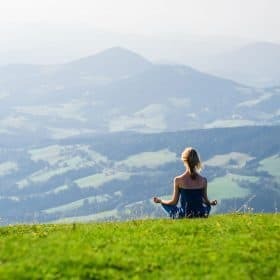 Our daily work typically takes place in a small space with the body at rest, most often sitting, and we have to find make time for physical activity. This exercise is easy to do anytime during the day, no matter how busy you might be. Chances are, you’re going to want to do it often! And that’s a good idea, since repeatedly practicing the opposite movement of FHP is just the thing to counteract it. This move opposes FHP by targeting the muscles that suffer most from this unnatural posture: the anterior neck flexors. These are deep muscles that stabilize the cervical vertebrae and also allow for range of motion. This muscle has three portions. The superior oblique portion lies directly against the front of the third, fourth, and fifth cervical vertebrae and inserts at the topmost cervical vertebrae, called the atlas. The inferior oblique portion is the smallest of the three parts, and it originates from the first two thoracic vertebrae and inserts into the fifth and sixth cervical vertebrae. The vertical portion originates from the upper three thoracic vertebrae and the three lower cervical vertebrae, and inserts into the second, third, and fourth cervical vertebrae. As you can see, this is a very deep muscle that, when tight, can result in cervicalgia and wrong head position. Inversely, holding your head incorrectly can cause the muscle to become tight. Relatively thick and wide at its origin at the third, fourth, fifth, and sixth vertebrae, the longus capitus narrows towards its insertion point at the front of the occipital bone, which is the bony plate at the very base of the skull. This muscle is quite small but important nonetheless. It is short and flat, and originates from the transverse process (the bony “wing” that goes out to the side of each vertebrae) of the atlas. It inserts into the occipital bone. It lies roughly in the area at the base of your skull behind your jaw. This is another short, flat muscle. It also originates on the transverse process of the atlas, but on the inner part of the bony projection, closer to the center. It inserts into the front of the occipital bone as well, but once again, closer to the center. It is a very deep muscle; if you were to draw a line forward and out from the rectus capitis anterior, the line would come out right above your upper teeth. These are the main anterior neck flexors that are forced to contract constantly with FHP, thus causing them to weaken and become shorter. That’s because FHP adds weight and load to your neck muscles. For the average person with a 12-pound head, each inch forward adds another 10 pounds of weight that your neck muscles must hold up. Then the anterior neck flexors shorten and weaken as other muscles step in to compensate for the weakness caused by the unnatural weight and subsequent strain. In contrast, the Cervicalgia And FHP Technique counteracts FHP by moving the head back and stretching the neck flexors. You can do this exercise sitting down or standing up. Start by placing the fingers of your left hand on the upper part of your right clavicle (collarbone). Lay your right hand over your left. Push down lightly on your right clavicle and look up and to the left. As you hold the stretch, pull your jaw forward into an under-bite position (think bulldog). You should feel a slight burn from the stretch, but if it hurts, decrease the stretch or simply stop. Hold the stretch for about 20 seconds, and then release and switch sides. Feel free to repeat this exercise throughout the day, and you might want to follow it with the Neck And Vertebrae Aligner. You’ll find that cervicalgia begins to lessen and disappear as you practice these types of moves, and that your neck posture will improve. While cervicalgia refers to neck pain, it is a specific kind of pain that does not radiate down your back or arms. Cervicalgia is usually sharp upon movement, especially when you rotate your head. There may also be a constant ache and feeling of tightness in your neck and upper back. Cervicalgia can also cause tension headaches. 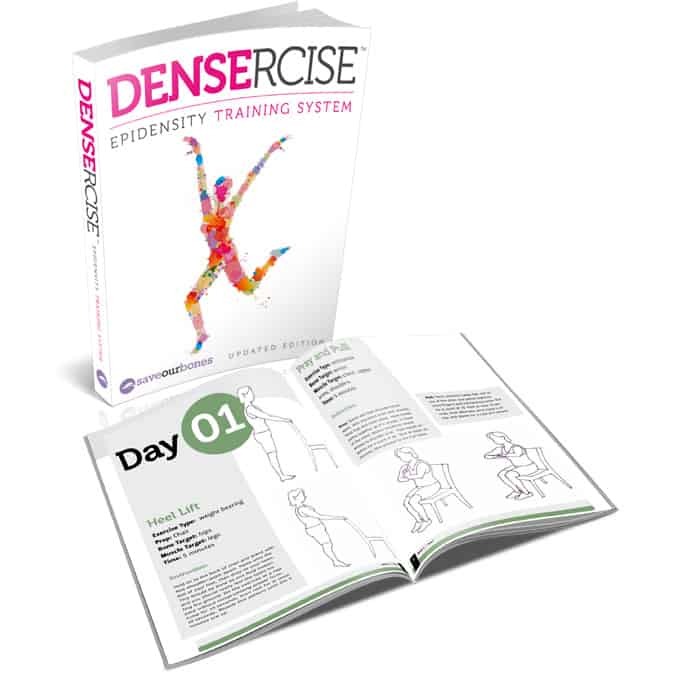 Of course, this muscle strain and tension undermines the integrity of your cervical and thoracic vertebrae, which is one of the main reasons why posture is an integral part of the Densercise™ Epidensity Training System. You’ll find a variety of exercises that focus on the neck and upper back in Densercise™, because this area of the skeleton is so pivotal for overall bone health. Your spine follows your head, and then the rest of your body aligns accordingly. So moves like today’s exercise along with the postural exercises in Densercise™ are the perfect way to ensure that you don’t suffer from the detrimental effects of FHP. Please let the community know your thoughts about this weekend’s exercise by leaving a comment below. Thank you for all you do to keep our bones healthy. Lately I have been having neck pain, which I now realize was the due to stress. Your exercises and stretching for neck pain are wonderful. I can already feel the difference. We’re sorry you’re having difficulties! We will be glad to help you get things figured out so you can use your Densercise materials – please check your inbox for an e-mail from Customer Support. Thanks for this exercise. When I do it I can feel the stretch. However a couple of seconds after I push my jaw out I hear a sort of singing noise, when I pull my jaw back in it stops immediately. I kept repeating this and the noise starts and stops every time. About Vitamin B 12- does parsley contain this vitamin? Keep breathing, Pegge! You don’t want to hold your breath for this (or any) exercise. Good morning Vivian, I have the dancercise e book I do have a question though. Since I had bought the book years ago does it update itself with new exercises that you have recently researched? PLEASE do let me know how it works I guess I am one of your community member who is not lucky as my bone density is still in a declining stage. Your input will be appreciated. Thank you, have a good day. Not to worry – the material in Densercise is essentially the same and contains the same bone-building exercises as it did at the beginning. The Weekend Challenges are different than the moves in Densericse, and make great additions to add variety to your Densercise routine! Thank you so much for a prompt reply.